If you’re looking for THE definitive start to finish guide on building a Windows 7 Image from scratch in MDT2013, I highly recommend using Johan’s guide here. When I first started this blog, there weren’t a lot of real “noob friendly” guides out there. There were lots of stuff on Windows Vista and Windows 7, but there weren’t many Win8 guides, but with the popularity of Windows 10, there’s now tons of guides out there, and rather than make an attempt to out do Johan or Mr. Niehaus I’ve linked to their guides above. Something here is key – Always, Always, Always, build your reference images in a Virtual Machine. It doesn’t matter if you use VMware, Hyper-V, or even Oracle’s Free VirualBox. Building reference images in a virtual enviroment allows it to be truly hardware independent. The days of building a separate image for every single make and/or model you support will be long gone once you stop building reference images on physical hardware. Worst case scenario is you’ll be supporting an x86 image and a x64 image, but even that’s unlikely, as x86 is effectively headed the way of DOS. Before we even start talking about how to build an image, lets talk about what kind of image you want to make. Thick? – All drivers and programs. This is the “old school” approach, with very little flexibility. If you’re building multiple images per model, it’s a thick image. Don’t do that, use MDT to inject drivers and install apps at deploy time. Thin? Oposite of Thick. Usually just the OS and nothing else. The thinnest image you can get is the .wim file from the iso. This is too far in another extreme, an image like this takes forever to update and patch at deploy time. Hybrid? Best of both, a good hybrid image could include Office, OS updates, and some other core/universal business apps. I advise to go this route. Keep firefox, adobe and flash out of your image, these update almost monthly, if not weekly and are very easy to install at deploy time. Check out my applications cheat sheet for the syntax needed to install apps silently at deploy time. The more you keep out of your image, the easier it is to maintain. First off, you need to get MDT 2012 Update1 and the Win8 ADK installed. Check out my getting started guide here. Create a VM. Next you need to set up a VM we can use to build the image in. I prefer HyperV, but if you’re broke and/or cheap, virtualbox will work just as well. Some of my earliest images were built using this. Regardless of how you build the VM, allocate 2 gigs if you can for the VM. Find a copy of Windows8. You’ll obviosuly need a copy of Win8. As of now, you’ll need a retail ISO or find the wim file somehow. If you have a TechNet subscription like me, you’re in business. Build Your Share. A Standard Client Task Sequence is Fine. If you plan on putting office in the image, add Office into applications, and configure it for an unattended install if you can, if not you may get away with doing that when lite touch suspends. Import the OS. In that share you import the .wim file into operating systems. You don’t need setup.exe files for Win8. DISM handles it. Build a task sequence. set capture=yes in your customsetting.ini file and tweak your answer files. Configure your share. Remember, if we’re building a reference image, we want it up to date, so turn on updates in the task sequence before and after applications. Update the share. Right click the share in the left menu and select update. This takes some time, so go watch some of Johan’s lite touch unleashed in the meantime. Fire it up! Configure your VM to Boot to the LTI media inside \\Server\Share\Boot in the VM. Wizard Tweaks. When going through the lite touch wizard, choose the option to capture an image, and where you want to copy. 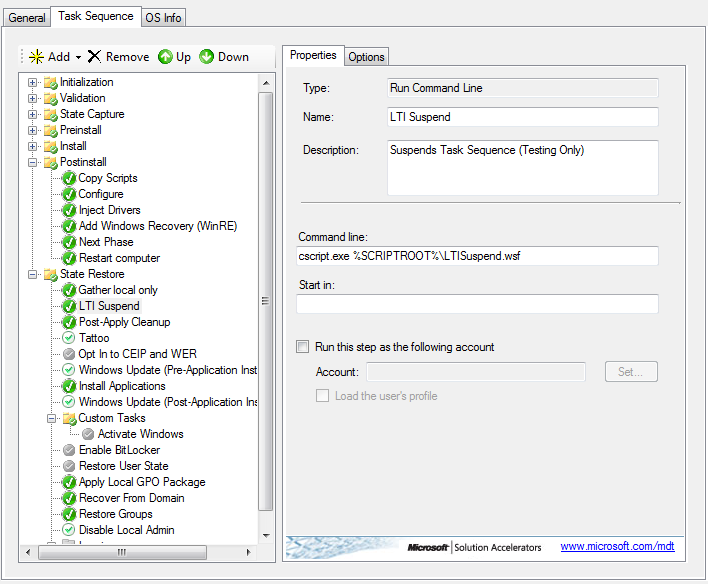 When LTI suspend runs, make sure to make your changes, install the apps you absolutely can’t automate (less is more here) and select resume from the desktop. Sysprep. MDT will then sysprep and capture your image for you. 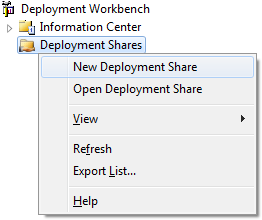 Create a second share to deploy.